As you may have noticed (I think it’s hard to have missed it) Donald Trump is about to be sworn in as President of the United States. It always seems strange to me that it takes America so long to swap over after elections, but here we are, today is Inauguration Day. And being a news person, that means this week I’m thinking politics and books about politics. 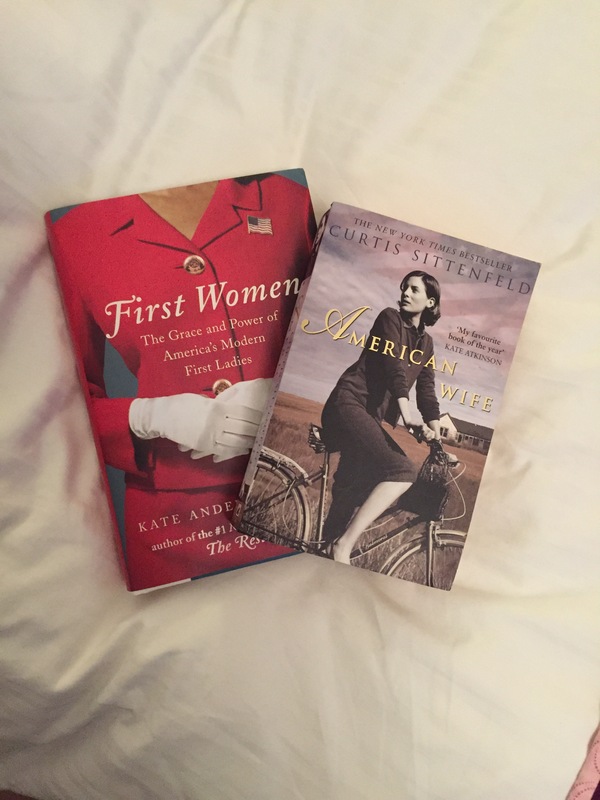 Regular readers will know that I’ve been reading Curtis Sittenfeld’s American Wife for sometime – it’s been my bedside book, although this week it’s had an upgrade – and I’m also reading First Women which I got for Christmas. All of which means my reading this week has been fairly American politics heavy. I’m at work getting ready to watch The Donald take charge (oh the joys of scheduled posting), but if you’re not watching – or if you’ve watched and want more politics, here are some reading suggestions for you. Primary Colors tells the story of Jack Stanton, a southern governor making a presidential run. One of the blurbs coyly says that some characters and events ressemble real-life figures – but it doesn’t take much knowledge to work out that the people in question are the Clintons and that this is a fictionalised version of Bill’s presidential campaign. I read this on holiday last year, and although it’s incredibly readable, I really hope that the machinations in this are an exaggeration. If half of them go on in real life, it’s a worry. Worth reading if you haven’t already – you’ll probably end up down a Wikipedia hole as you try and work out which bits are true(r) and which are made up. This is a proper weighty tome. It covers all of JFK’s life – but not much of the fallout (and conspiracies) after his assassination. I came away with a much better understanding of what he stood for and what his background. It’s not salacious – although the other women do get mentioned – but you do get a lot of detail about his family background and his medical history and how all of this influenced him. I came away with a strong dislike of his family and strongly mixed feelings about him, but it’s definitely worth it. If you want a Kennedy fix, but don’t want a biography, (or if you’ve read the biography and still want more) try this. Nora Brennan is newly arrived from Ireland when she gets a job as a nursery maid to a family in Brookline. She ends up on the inside of American history as she looks after the Kennedy children and sees their parents try to build an empire. It takes you through Joe’s time as Ambassador in the UK and WW2 and beyond. Warning: you may not like many of them (detect a theme here with the Kennedys?) but it’s worth it for the wit and warmth. The history is spot on as well which is what Laurie Graham does so well – if you like this, search out my favourite of hers Gone with the Windsors. Slightly left field this I’ll admit – because it’s not about American politics but an English aristocrat in the Eighteenth century. But Georgiana (pronounced George-ay-na in this case not George-ee-ana like Pride and Prejudice) was a political activist as well as a famed beauty and the queen of fashionable society, and this biography deals with that as well as with her (very) complicated love life. She’s another person who I didn’t like very much, but I was fascinated by her story. A film of the book was made a few years back featuring Keira Knightley which I keep meaning to get around to watching. Sick of modern politics? Need a reminder of how bad things used to be? Read this. Turns out Imperial Russia was even worse that I thought – and I’m only just at the latter stages of the war against Napoleon. So far there’s been patricide, filicide, plain old homicide, usurpers, wifes sent to convents, imprisoned deposed rulers and so many horrible murders and inventive torture methods. So many. So gruesome. Some involved spikes. I’m listening to the audiobook and I can confirm that I run faster when listening to tales of horrible doings – probably because I don’t want any of them catching up with me! What’s next on my list? Well I have Paula Byrne’s book, Kick, about JFK’s sister sitting on the pile, so I might read that. In all the Kennedy books I’ve read so far she’s probably come off as the nicest of them although she died young and had a bit of a tragicl life. And as she married the eldest son of the Duke of Devonshire – so it sort of ties in nicely with Georgiana too!